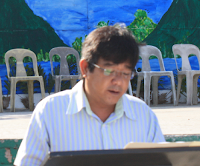 Random Thoughts of Gil Camporazo: Uniting with the Nature, How? Uniting with the Nature, How? To kick off the La Carlota week-long environment week celebration, a brief program was held at plaza in the morning then followed by a tree planting in the afternoon..
Two speakers, city councilors Jacob E. Liansing and Jacky Jalandoni shared their messages focusing on how the mother earth could be protected through cooperation and commitment beyond environment week celebration and even be one with the nature. They are in one in campaigning for the protection of the Mother Earth. This year's theme is "Green From Above. Blue From Below"
In the afternoon different government agencies with their respective representatives planted a tree at the Teacher's Village, Brgy. Roberto S. Benedicto (RSB), La Carlota. 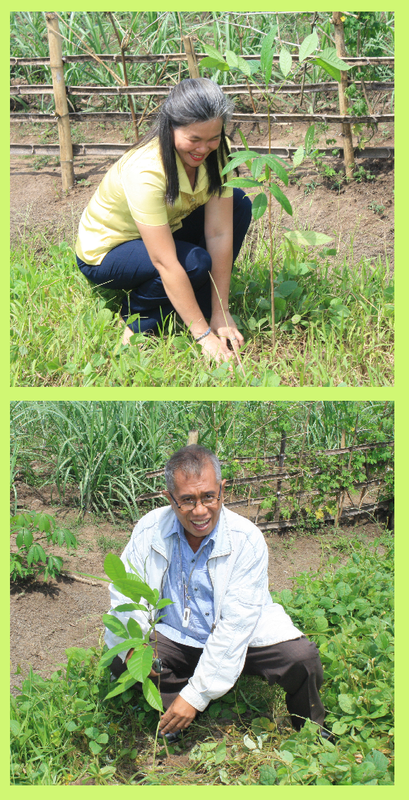 The 50 mahogany seedlings were facilitated by ENR Senior Environment Specialist Othello S. del Rosario and distributed to the participants. 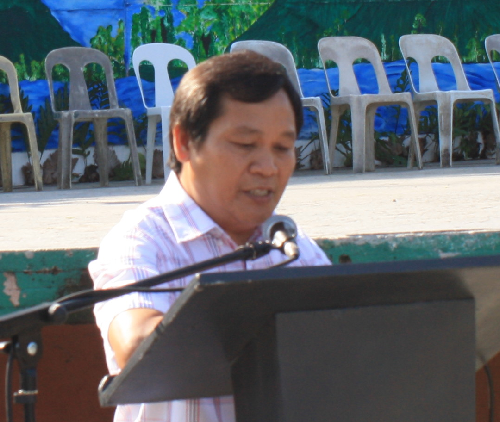 The Department of Education (DepEd) was represented by OIC-ASDS Portia M. Mallorca, the Barangay Cubay by Brgy. Capt. Noel Vargas, and Cubay Elem. School by the principal Gil Camporazo, the author. Other agencies were also representative by their heads or representatives. "The city environmental week celebration brings us back again to the time when God commanded man to replenish th earth. I wish that this occasion will challenge us to review our individual contribution to help our assaulted environment. 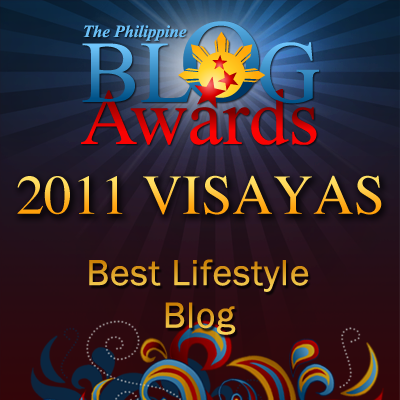 The Philippines has been suffering from a chronic environmental crisis which is mostly accounted to man's negligence. "Our forests were clear cut, dynamite blasting and the use of cyanide to fishing are rampant, solid waste is running out of disposal capacity, and the many vehicles spewing noxious fumes plying the streets,only prove that man is the primary culprit to the environment destruction. Therefore, we who are here today have the greatest responsibility to restore what we have taken from our nature. "As we celebrate the week-long environmental consciousness, let us also be one with our nature. Our city government is doing its part to implement programs which are environmental from all of us, it is impossible for the local government to establish friendly relation with the nature. "I hope that starting today we can do simple ways to protect our environment. We have been enjoying the blessings of the earth. 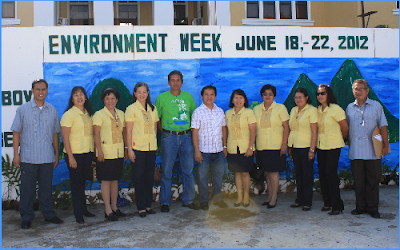 We ought to protect the earth for ourselves..."
"Today marks this opening ceremony of our annual environment week celebration. This is one of the most important celebrations for us to heighten our initiatives towards environmental protection and conservation for the whole week. We have lined up various activities to promote awareness among our people the importance of healthy environment into our lives. "The last few days,our locality and parts of the country were experiencing flash floods due to heavy rainfalls brought about by typhoon "Butsoy" which cause to the lost of lives and properties. Nowadays, we are experiencing an extreme heat of the sun. Our temperature today as we have experienced is far different from the years ago due to climate change, and the root cause of all this is the abuse of mankind to the environment. Therefore, whatever destruction we made to our mother nature will also affect our quality of life. "Our government is doing its best to protect the environment and to give quality life to the people. However, it needs the full support and cooperation of everyone. Hence, the task of protecting our environment is not only the obligation of the government but of the people as well, all of us can help protect our environment by cleaning and greening our own surroundings as our basic contribution. "My fellow earthlings, may our efforts to protect our environment will continue beyond our environment week celebration. Let us continue to make necessary steps to save our mother earth..."